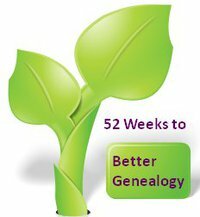 Week 35: Examine the Daughters of the American Revolution® Genealogical Research System (GRS) Even if you aren’t a member of DAR, you can benefit from this wonderful database. Look at the page and enter some test searches. If you know of a Patriot in your line, try that name in the search box. If you don’t have a Patriot name, use John Smith. Explore the results and see the type ...of information you uncover. Bloggers are encouraged to share their knowledge of this great research tool with their readers. You start from the home page by clicking on 'click image to open GRS'. Since I had been to the webpage before, I was taken directly to the ancestor search page. I knew I had three ancestors that were patriots. The three ancestors were Alexander Glover, Moses Poor, and Hopkins Rowley. The information that I found included ancestor number, state of service, rank, birthdate and place, death date and place, service source, and service description. If you click on the ancestor number you will find residence, spouse and associated applications and supplementals. The associated applications and supplementals section will show children. This page also tells you if supporting documentation is available and if a descendants list is available. Each person who is listed here will have a nat'l number that you can click. Service Source: HAMMOND, ROLLS OF THE SOLS IN THE REV WAR, STATE PAPERS NH, VOL XIV PP 52,53; NARA M881; COMBINED MILITARY SERVICE RECORD. I was so encouraged by the information I found on the above two patriots, I couldn't wait to research my third, Hopkins Rowley. I had found some historical information (secondary sources) about Hopkins Rowley being a Green Mountain Boy and the taking of Fort Ticonderoga. So, I thought good now I can learn more about him. I guess I was counting my chickens before they hatched because when I searched for Hopkins Rowley, I got the dreaded notice "TREAT AS NEW ANCESTOR". Why do I say dreaded? Because this means that no application or supplemental application information has been verified since earlier in the society. This means that all information must be documented using today's standards. It wasn't a total washout as I did see some information. Since the 52 Weeks to Better Genealogy prompt was posted I decided to see if I could find any other patriot ancestors. Rather than blindly type in surnames, I decided to see who in my family tree was of the age to have served in the American Revolution and look for their names. I found three other ancestors in the database: Seth Beal, Thomas Bowles, and William Salisbury. The DAR website opened up new resources for me to check and to learn more about my ancestry. If you haven't checked the DAR website out, you should. You never know who you may find.